Your entrance into the Church will culminate with the service of Baptism and/or Chrismation and receiving the Holy Eucharist. If you are not already baptized you will receive baptism by immersion according to the command of our Lord Jesus Christ. Baptism washes away our sins, and makes us members of the Body of Christ. There is no other way to become a Christian, and enter the Church. Baptism is necessary for us if we are to become disciples of Christ, and every single believer in Jesus Christ must receive baptism. With the waters of baptism, the sins of our past are washed away, and we emerge a new creation, alive in Christ Jesus. As baptism is a person’s participation in the death and resurrection of Christ, so Chrismation is a person’s participation in the coming of the Holy Spirit at Pentecost. We live life in the Holy Spirit, Who is the Giver of Life, and since there is no such thing as a ‘half-Christian’ all those who are baptized receive the Holy Spirit in the Mystery of Chrismation. 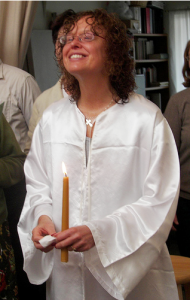 In western Christendom, Chrismation became known as Confirmation and was moved to after the first communion. 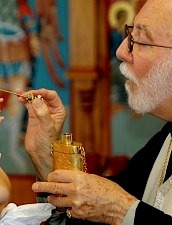 The Orthodox Church retains the ancient practice following the type of the consecration of the Old Testament High Priest. There is nothing to add or subtract from the words of the Lord here. It is our great joy to obey and receive His Holy Mysteries for the sanctification and salvation of our souls. Finally, you will enter into a period of time which we call Mystagogy, which means ‘initiation into the Holy Mysteries.’ This is, above all, a life of discipleship. 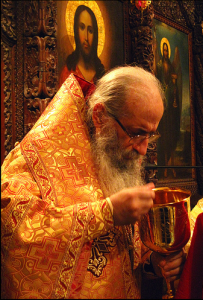 The life of an Orthodox Christian is a life devoted to Christ in every way. Prayer, fasting, tithing, almsgiving – love in action in every part of our lives. Above all, your life journey has not been unfruitful, and is about to begin a new and exciting chapter. Your life as a disciple of Christ will take on a deeper connection, as you learn to be spiritually watchful, applying the words of Scripture to your spiritual life under the guidance of an experienced spiritual father and guide. You’ll learn to recognize the glimmers of temptation and reject them noetically. The Bible will come alive in an entirely unexpected way as you sing and pray the words of Scripture at every liturgical service throughout the year! And your experience of worship will surge into your new life as a powerful experience of heaven on earth. The Lord really does make all things new!